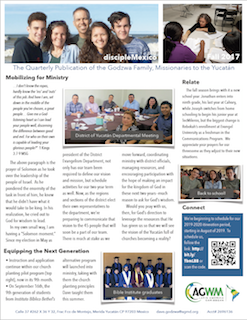 disciplemexico.org · Our Fall Newsletter is Available for Download! Our Fall Newsletter is Available for Download! Where you are, I imagine fall means cooler temperatures and the anticipation of seeing the leaves of the trees change their colors. It’s a great season to spend outdoors, especially after the heat and humidity of the summer. Here in the Yucatán, however, where rainy season is in full swing, we’ve been seeking shelter from climate, never venturing outdoors without a trusty umbrella at our side. Still, our loss is your gain! Our time inside has afforded us the opportunity to produce our latest newsletter! The task of mobilizing for ministry within the District Evangelism Department. And updates from our family as we move into the new school year.